The Financial District is rife with little out of the way lunch places that I can never seem to get to since I don’t work down there anymore and they are not generally open on weekends. It is a bummer as some look quite appetizing. Still, every now and then I can sneak a few minutes to take the dreaded MUNI downtown and grab a bite at some places which offer quick portable bites I can nosh on while I get back on Muni to go to work. One of my old favorite haunts from when I was part of the masses in FiDi was the International Food Court, a funky little spot for those in the know that sits underneath a nondescript building at the corner of Bush and Kearny and is accessible down a set of seemingly suspect stairs. It is kind of like a food court you might find in a mall but on a smaller scale and featuring more local mom and pop cooks serving up traditional dishes from around the world. Over the years some of the vendors have changed with varying degrees of success. Like one of my top lunch spots Bimbim Bar, which continues to serve up some tasty and affordable bowls. I noticed on one of the local city blogs a new place was moving in with the intention of serving up borsch, dumplings and pirojki based on their own family recipes. Called Pushkin, I figured I’m a sucker for a some really good baked bread filled with stuff and this seemed like the perfect grab and go I could try in my spare time. This city it seems is quite rife with Russian offerings from Cinderella and Moscow & Tbilisi Bakery to Russian Renaissance Restaurant to Cafe Europa and so on. If it is good, I am totally on board with adding another, I mean, look how many taquerias, falafel joints and pizza places we have in this town already, why no something different? 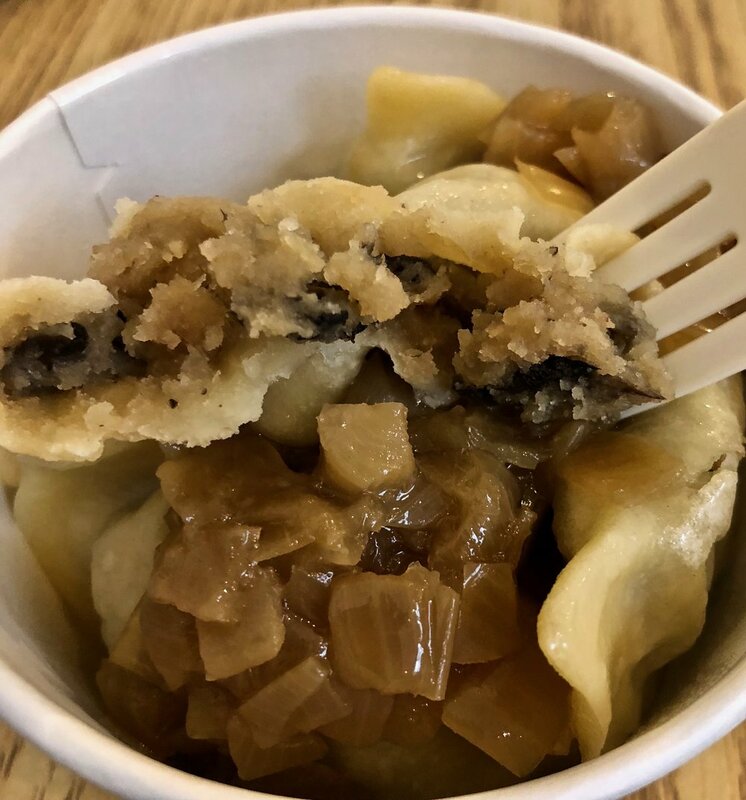 Their space is really a small booth like thing and you can see them making the dumplings and pirojki right there so you know right off, it is all fresh and hand made—a real bonus. Initially part of what is appealing to me beyond them making stuff I can see, are their prices, which are downright reasonable for SF. Suddenly I want to try everything! But I’m making an on the spot decision to try a couple things now and then come back another time to try something else. I mean, if I am going to work I need to pace myself. Old school traditional seemed a way to start this off with a bit of borsch. I got the small cup which is about 12oz and will run you $5. There is also one a double size of that for $8. I went small and you get a decent serving size which is chock full of chunks of beet, beef and shredded carrot pieces. This served warm, which I prefer and I did like it the earthy comforting taste, though they did kill it with a bit too much dill on top. I do like dill but this was a bit much. I managed to scrape some off so it would overwhelm the soup and let the the natural flavors or root vegetables shine through. The soup itself was a tad thing and a little oily but there are some good flavors going on here enough to look past both that and all the freaking dill! I know some places put a dollop of sour cream and this might have benefitted a bit from that but as is, on a chilly, foggy day in SF this small cup could warm you up. The offer some seasonal pikjorki and I opted to add on the spinach and feta one to go with my borsch and they only run you $4. That is right, for $4 you can get this hand made large sized roll filled to almost overflowing with stuff! The price alone before I even tasted it made this shine in my eyes. One bite in also made it shine for my taste buds. This was stuffed with hearty spinach and salty, tangy feta in a warm, soft and almost buttery tasting bun. This golden brown puff of bread made it a perfect compliment to the borsch. Beyond the bread, with all the beets and greens I felt like I was eating super healthy too. This is what hearty filling food that tastes pretty good is like. And for $9 total, it was a satisfying lunch time meal where I feel I overpaid and wasn’t still hungry. My next visit I was intrigued by the offer of dumplings, kind of a Russian version of pot stickers. They offer a handful of different stuffings in a $7 small and $11 larger size. I opted for the small size portion of potato and mushroom vereniki which said it would be pan fried and served up with sauteed onions. I guess I thought it would come with a little bit of brown friedness on it but the above is what I got. These looked more like the boiled version and came with the onions and a dark brown broth, almost like a dumpling soup as it were. Maybe we have different ideas of what pan fried means? But since I got to go I can’t say I noticed until I opened up the container. Still, they were filled nicely with mushroom which you could taste and the potato added some extra creaminess. The dumpling itself was soft without being too sticky or gummy and was like a nice ravioli with a bit of al dente to it. The onions added a pleasant layer of sweet earthiness to it all. Taste wise it hits all the points, though I do wonder if pan fried might have been different. At $7 a cup, in essence you get about seven or $1 for a dumpling which is just this side of a ravioli. 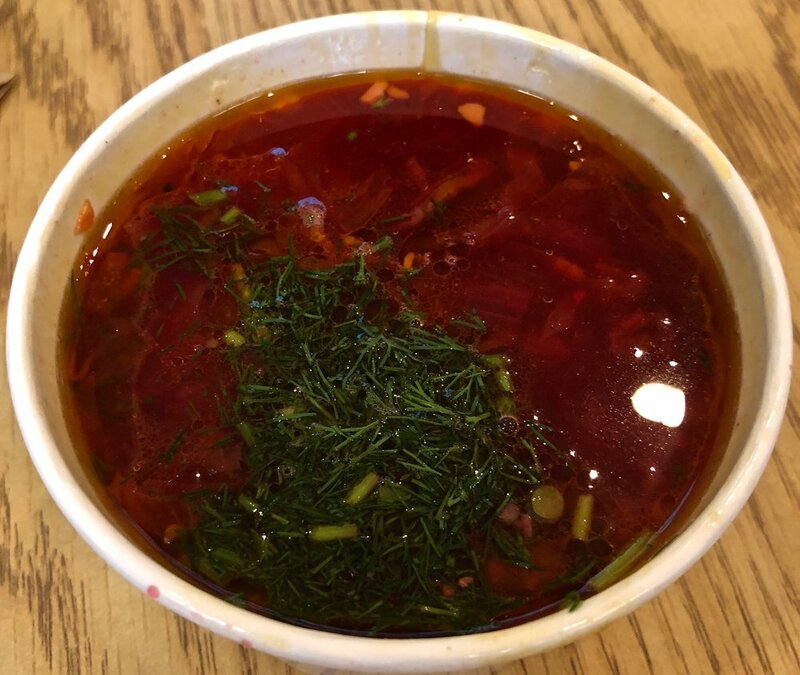 I’m a little torn on the price, and while for the most part I enjoyed them, I wasn’t totally sold on my whole cost ratio to what you get thing when compared to the borsch and pirojki. But still worth trying for sure. This time I paired it with a beef and onion pirojki, still $4! Tons of ground beef tucked inside soft buttery dough with just the right amount of onion to perk up the flavor. In a pirojki I always like how the grease from the cooked meat soaks into the bread adding some extra flavor to the bread. It was like a super tasty greasy hamburger from your favorite corner joint. Simple, tasty, filling and hits the right spot for comfort food and yummy lunch. I wasn’t done however, as they had a pirojki filling version I had not seen before—apples and cinnamon—and I just could not pass it up. In the end, it is the pirojki that sings here with its warm soft bread and lusciously tasty fillings for a price that won’t break your wallet and will satisfyingly fill you up more than that over $10 sandwich you got. Add in a small bowl of borsch and you will pretty much be set for the rest of the day. And if you are in the mood to splurge, the apple, cinnamon, raisin pirojki is just a divine little topper which stands out all on its own. Sometimes it is the small simple hand made things which really stand out and Pushkin has plenty of those to choose from. I will definitely be swinging by there again for some grab and go treat. Until then, das vedanya comrades!